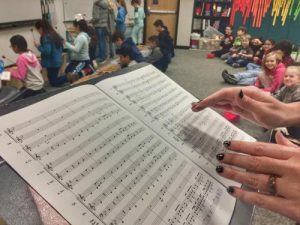 The new year, 2018, is starting very well for Mark Twain Elementary School music students. The Carson City School District is pleased to announce a $16,000 grant awarded to Mark Twain Elementary for music education. The monies will be used to purchase new musical instruments including a 50-piece world drumming set, steel drums, hand chimes and various other percussion instruments. Christina Bourne, Mark Twain Elementary’s music educator, applied for an $8,000 grant, which was later doubled through the Mockingbird Foundation, an all-volunteer nonprofit founded and run entirely by Phish fans. The foundation recently announced 16 grants totaling $137,400 in support of music education for children at schools, centers and non-profit organizations in 15 states. The grants came from Mockingbird’s 22 round of competitive grant-making and were enhanced by funds from the band’s own WaterWheel Foundation, which allowed the board to double three of the grant requests. Mark Twain Elementary School was one of the three grant requests where funds were doubled. The 16 grantees were selected from 643 initial applicants who requested more than $4.4 million, far beyond the foundation’s resources. Due to the high demand, Mockingbird’s two-tiered online application process remains one of the most competitive in the nation. Each year, they are able to fund a slightly higher percentage of inquiries, making grants slightly less competitive, thanks to the generosity of fans supporting the foundation. The Mockingbird Foundation is the leading provider of historical information about the band Phish and its music, having cultivated intellectual property through phish.net since 1994. A leading grant-maker in music education for children, the foundation has now made 364 grants, in all 50 states, totaling $1,271,640. Proceeds are generated by celebrating the music of Phish through comprehensive books, innovative recordings, special art prints, creative donation premiums and special events for the Phish fan community.